Bishop Auckland maintained their 100% start to the league yesterday with a 5-2 victory against Ryhope Colliery Welfare. Bishop Auckland’s Darren Richardson opened the scoring for the home team following a goal mouth scramble that resulted in the midfielder being the first player to react to the loose ball and being able to slot the ball into the back of the net. Two minutes into the second half, Colliery Welfare found an equaliser with a great effort from winger James Ellis who got onto the end of a Micky Rae cross to fire a volley into the bottom left corner of the goal from the edge of the box. Bishop’s lead was soon reinstated as Kyle Patton was taken down by Corey Nicholson inside the Ryhope penalty area resulting in a penalty for the home team, which Callum Patton was able to convert into the bottom right of the goal. Five minutes later Bishop Auckland grabbed another goal, this time through Andrew Johnson who pounced onto the loose ball in the box after a good initial save from Jonny Ball. With ten minutes of normal time remaining Callum Patton put the game beyond any doubt after slotting the ball in at the near post after a deep cross from Christopher Salmon. Salmon turned from provider to scorer in order to grab Bishop’s fifth goal of the game after beating the Ryhope defender and then slipping the ball past Jonny Ball at his front post. 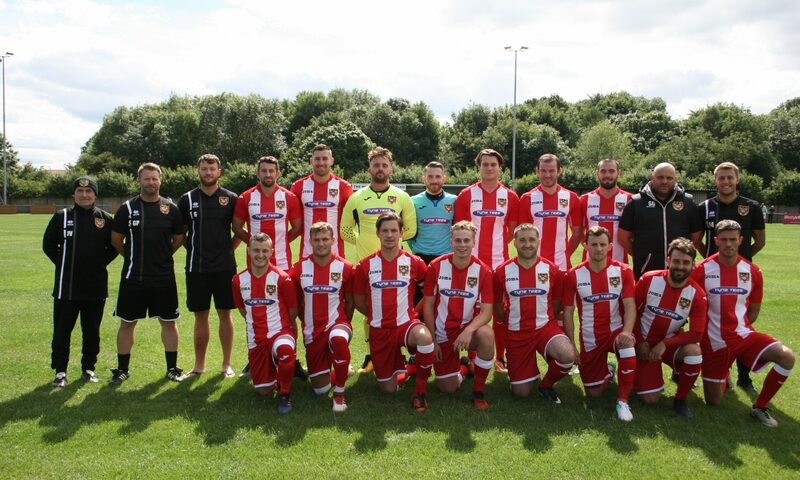 Three minutes before full time Ryhope were able to grab a consolation goal with James Ellis grabbing his second goal of the game after picking up the ball on the edge of the box and slipping it into the bottom left of the goal. Going into the game Bishop Auckland were looking for their third league win in a row, however the visitors were looking to add to the three points that they earned on the first game of the season. In the early moments of the game both teams had chances, the first came in the first minute as Jonny Ball tipped a Callum Patton free kick just over the bar. Ryhope started the better of the two teams producing multiple chances inside the first 20 minutes, one of them chances fell to James Ellis who broke through the Bishop defence and was able to get his shot away however the keeper was able to easily gather the ball at his feet. The visitors almost found an opener through striker Micky Rae whose powerful shot nearly hit the back of the net after a well worked corner routine. Although Ryhope started the better of the two teams, Bishop were starting to get into the game, forcing two smart saves from goalkeeper Jonny ball. The first was a save to deny Christopher Salmon after the winger was able to beat left-back Davey Gordon, Hoganson’s effort was also well saved by a diving Jonny Ball. Debutant Carl Jones proved his aerial prowess and he was able to deny the home team an opener after beating the home team’s striker to the ball from the corner. It was the home team that were able to find the breakthrough just before the half an hour mark when Darren Richardson was able to slot the ball home after a mix-up in the box for Ryhope which resulted in both Carl Jones and Davey Gordon leaving the field through injury. Just before half time Ryhope almost found a way back into game through James Ellis however his header was easily gathered by Nicholas Liversedge. Ryhope came out in the second half looking for an equaliser which they found two minutes into the second half through an excellent volley from James Ellis on the edge of the box. Suddenly the game was sprung back into action with both teams now looking to take the lead. Two minutes later, Corey Nicholson got wrong sided by Kyle Patton and brought the player down, resulting in a penalty kick which was coolly converted by Callum Patton. Five minutes later the home side strengthened their lead through Andrew Johnson who was able to pounce onto the ball after Jonny Ball’s low save. With Ryhope needing two goals in order to get something out of this game they substituted on Robbie Bird to inject a new attacking threat onto the game. Ryhope almost found a way back into the game when Micky Rae struck the crossbar with a powerful shot from outside of the box. Ryhope continued to create chances however were still unable to grab a goal. On eighty minutes Bishop Auckland grabbed a fourth goal as Callum Patton scored his second of the game as he slotted the ball into the back of the net at the back post. Salmon grabbed a goal two minutes later to make it five for the hosts as he was able to squeeze the ball past Jonny Ball to top off a good day for the home team. Three minutes before the end of the game James Ellis was able to grab his second goal of the game however this was only a consolation goal for the visitors. It was a day to forget for the away team as once again it was a game of missed opportunities. Ryhope dominated for large parts of the first half however were unable to convert whereas Bishop Auckland were a larger threat in front of goal with the experienced Andrew Johnson being the figurehead of the attack. Ryhope now head into a midweek game against Whitley Bay hoping that they are able to get a victory.